Consisting of lead singer Gunther Uytterhoeven (also of Damn our Idols and Massif, and having a past with Serengeti and Saint Agatha), guitarists Jo Sente (whom apparently comes along with most ideas on which the band as a whole then constructs the songs) and Wim Van Cauwenbergh, bassist Jody Croes, and drummer Niels Schuyten, this Belgian Modern Metal band was founded in 2012. In early 2014 the quintet felt ready for its first serious recordings and entered the Starzone Studio for a session which would result in 4 full-length songs and a moody instrumental intro. Songs which display a somewhat slower type of Progressive Thrash Metal with Groove and Sludge elements...in other words, “something dark and heavy”. Still, there's a high degree of melody in each of the tracks, and the vocals steer away from growls, grunts, or any other of the more aggressive vocal stylings (well, except for a very short, somewhat growled passage in the EP's closing track “Asylum Of the Arcane”). Evidently, the music is built for impact, and listening to the EP will at least impact in a way that you wanna listen to it again and again, until each note is embedded in your mind. Great stuff, this, as you will be able to judge for yourselves by listening to the EP at its Bandcamp page: (www.) 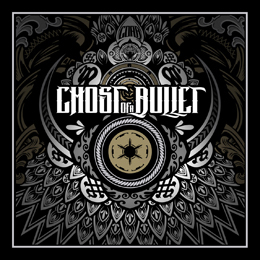 ghostofabullet.com will re-direct you to the band's facebook page, where you'll find the e-adress for the Bandcamp page, and a link to YouTube (which I regret to say, I did not check prior to the review – yoù go do it...now! ).